The following is a brief recap of the Tues., Feb. 20, 2018, BPS101 Regular Board Meeting. View BATV’s recording of the Tues., Feb. 20 meeting. View recap of Tues., Jan. 23 Board Meeting. 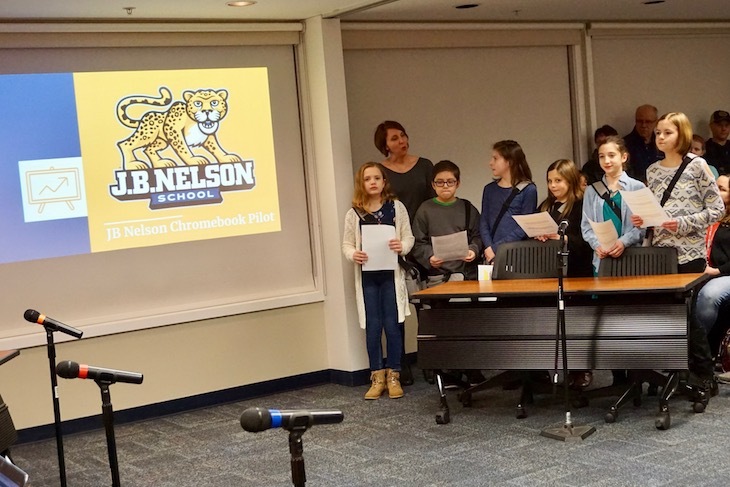 J.B. Nelson School fifth-graders presented findings from their “Chromebook pilot,” which allowed the students to take their Chromebooks home at night vs. the current practice of keeping them at school. 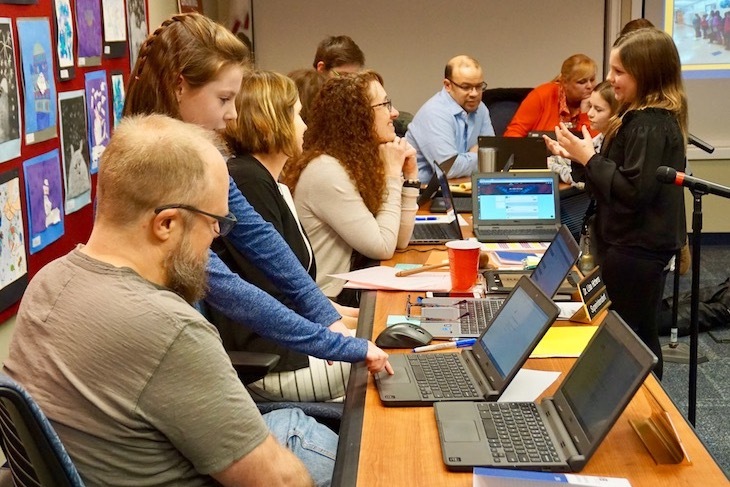 With the help of BPS101 Instructional Technologist Angie Sutherland and JBN Principal Nicole Prentiss, the students tracked and recorded their findings. An overwhelming 87% of students said that taking Chromebooks home helped them learn or accomplish their school goals this year. Students said they used their Chromebooks at home to access resources like the JBN LRC website; organize information and collaborate in Google Classroom; practice math and English using programs like IXL, and strengthen creativity via Google Docs and Google Slides. 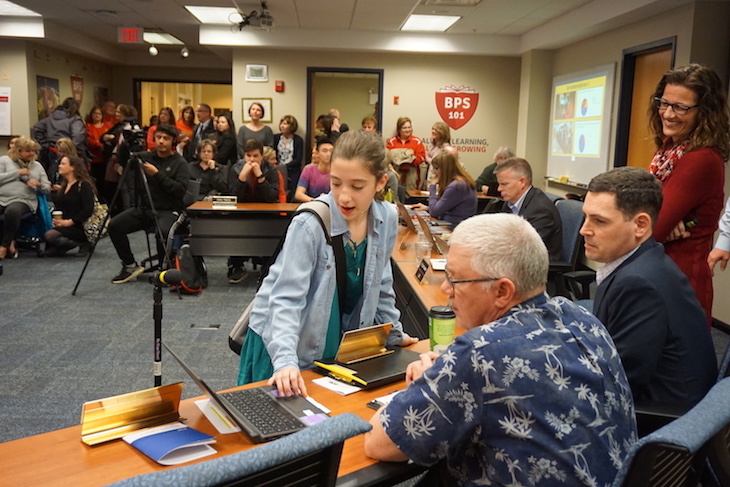 The students’ presentation included a one-on-one tutorial with each Board Member to show how they use their Chromebooks at home for flipped learning. With so much student voice and knowledge, the JBN celebration was terrific. 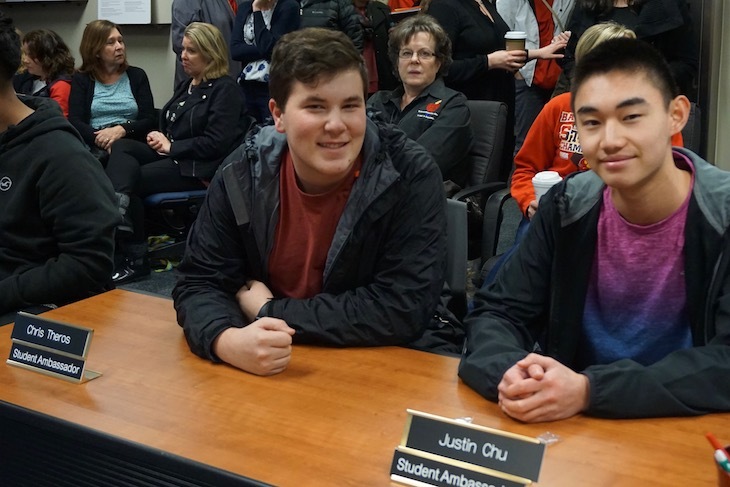 For their Board Report, Student Ambassadors Chris Theros, BHS junior, and Justin Chu, BHS senior, shared their personal stories and connection to BHS senior William Freiburger, who recently passed away from a life-threatening illness. It was incredibly moving to hear from Chris and Justin. The Freiburger family is in the hearts and minds of the entire BPS101 family. BPS101 Chief Academic Officer Dr. Brad Newkirk walked Board Members through this report, which outlines the goals and process the District will be using for staffing in the 2018-19 school year. Dr. Newkirk explained that a version of this report was sent to all BPS101 staff in January 2018 and that BPS101 Administration received feedback from Batavia Education Association leadership on the goals outlined in the report. He also stated that Administration worked with school principals and other building leaders to make sure that these were the right goals to drive some very hard decisions that will have to made during the 2018-19 staffing process. After the report presentation, Dr. Newkirk gave Board Members the opportunity to provide feedback. Board Members approved the purchase of cafeteria tables and seating from School Specialty for the sum of $101,999.63. The new tables will replace the existing 25-year-old tables that don’t have attached seats and require significant time on the part of the maintenance staff to move them for cleaning or a different set up. The new tables feature connected seating, allowing the breakdown and set-up to take half of the time. This purchase also includes flexible and soft seating, which will be installed in the atrium adjacent to the cafeteria. The Board approved the purchase of new heating and cooling system devices from Trane U.S., Inc. for Rotolo Middle School, Louise White Elementary School, and H.C. Storm Elementary School. The purchase price is $445,465 and includes installation and training. The Board approved the upgrade of the District’s two-way radio system from Communications Direct, Inc., in the amount of $41,305. BPS101 Director of Information Services, Don Seawall, explained to the Board that the District currently operates approximately 100 handheld two-way radios. During recent Emergency Operations Plan exercises, it became apparent that the current system does not have the capacity to handle high-volume radio traffic. Tues., March 20, 7 p.m.